It’s still considered the current star of Acura’s lineup, but now’s there a bit of a snag. The new 2015 TLX sport sedan, of which almost 5,000 units were sold last October, has just been hit with a stop-sale order. The problem? Its nine-speed automatic transmission. 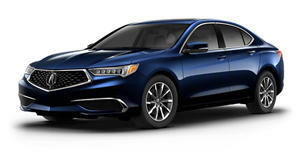 Acura has already informed the National Highway Traffic Safety Administration (NHTSA) of the recall, which affects about 9,500 cars powered by the V6. Specifically, the issue occurs when the transmission indicator is displaying "Park" when the transmission really isn’t in park. Acura claims that during the manufacturing process of the gearbox, it’s possible that some contamination occurred that could potentially cause the parking pawl not to engage, or it’s possible the park rod was damaged during assembly, which could lead to it becoming dislodged. This would in turn prevent the transmission from shifting into Park. Obviously this is something Acura needs to fix right away. The TLX is simply too important for the brand's future.